Even the largest and most sophisticated companies tend to look at energy costs in a piecemeal way — plant by plant, facility by facility. One reason for this is the inherent complexity of the energy marketplace. Another is the need for local facilities to ensure adequate supplies. Yet, by adopting a comprehensive approach to energy management, many companies discover significant opportunities to add value and reduce risk. 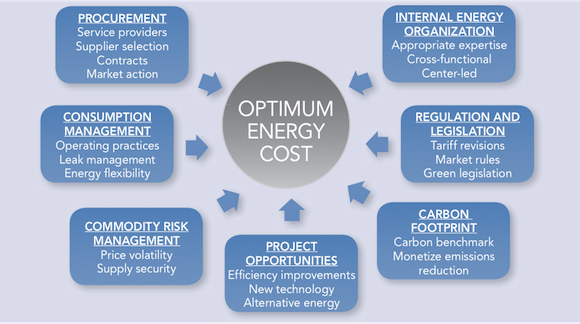 As the chart below illustrates, energy management embraces a variety of activities that are cost focused, such as establishing commodity prices, mission critical such as ensuring adequate supplies, and even policy- or community-focused such as green initiatives. Comprehensive energy management is the process of systematically analyzing all the aspects that influenced total energy cost, with the goal of arriving at an optimal energy cost. Chapter 10 of the just-released book Next Level Supply Management Excellence (Rudzki, Trent), is devoted entirely to the subject of comprehensive energy management. You can also obtain additional information by downloading the linked two-page PDF. This entry was posted in Energy, Robert Rudzki on July 20, 2011 by thedoctor. Focus in on the tail-spend data and figure out what is being bought, from whom, where, and for how much compared to market value. Focus on commodities that can be reclassified into a category that will have enough spend to be worthwhile. Once the category with the biggest opportunity has been identified, determine the right sourcing approach. If a sourcing project is the right approach, accelerate it with standardized templates, RFX, and/or auctions. If the right strategy is to spot-buy in a weak market, then aggregate demand across the organization and spot-buy through e-RFX or automated auctions. And, regardless of the right sourcing strategy, drive as much spend onto technology platforms, like P-cards, so that it can be tracked and analyzed. This entry was posted in Auctions, Best Practices, Cost Reduction, Procurement Innovation, RFX on July 20, 2011 by thedoctor.